Francois Hollande, former First Secretary of the French left Socialist Party (SP), won the run-off primary election on Sunday to represent the biggest opposition for the French presidential race next year. According to data showed after 2.1 million ballots were counted, 57-year-old Hollande won 56.38 percent of the votes, while his Socialist rival Martine Aubry, who conceded, claimed the rest. "I warmly congratulate Francois Hollande, who has tonight become our presidential candidate," Aubry told a press conference at around 1900 GMT when the counting was still underway. "The primaries has bestowed Mr. Hollande more legitimacy and more power for the combat against the right," she added. Her concession means the U.S.-style primaries, the first in the French history, had chosen Hollande to be the left-wing's favorite to challenge the ruling party, while Aubry will return to lead the SP as its first secretary. The Socialist Party had organized a two-round contest to choose its presidential candidate for the 2012 elections. According to the SP authority, turnout of the Sunday's run-off reached 2.7 million, more than the first round and far beyond the party's previous expectation of one million. 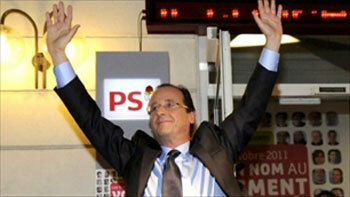 After the first round last Sunday, all four SP nominees who had lost later voiced their support for Hollande. Local pollster CSA estimated shortly after the closure of voting stations on Sunday afternoon that Hollande would garner 57 percent of Sunday's votes while Aubry could bag 43 percent. Noting the unprecedented attention drawn to SP primaries contest, the right-wing ruling UMP, however, said it would not choose its own candidate for the next presidential election in the same fashion. According to French Prime Minister Francois Fillion, French President Nicolas Sarkozy will represent the UMP in the 2012 election, though the president himself has not yet made a formal statement.